**New for 2017-2018 The Shark ION Rocket IR101 Cordless Ultra Light Vacuum. 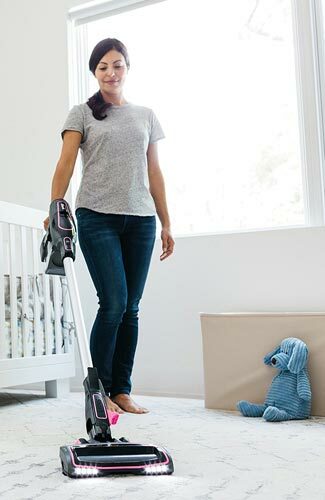 The Shark Ion Rocket is a lightweight multi-floor cordless vacuum that can clean high or low. Weighs only 7.2 lbs. The motorized brushroll can be used on both carpets and hard floors. Its low reach can get under beds and low furniture. The motorized head swivels for better manueverability. Washable air filter. This unit has pink accents. 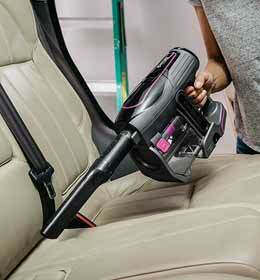 Detachable handheld allows you to clean stairs, upholstery and car interiors. Shark ION Rocket Features: The Shark IONFlex cordless has a detachable handheld, that can pick up hair, dust and dirt from pillows, upholstery, carpets, stairs, and car interiors. The wand can be attached to the handheld for high cleaning. This model includes 1 rechargeable lithium-ion battery (battery is removable) and a charging dock. If you buy additional batteries, you can charge one battery pack while cleaning with the other one, doubling your cleaning time. Each battery gets approximately 25 minutes of cleaning time on carpets. The Shark ION Rocket has no cords to tangle, is ultra lightweight, and has LED headlights to see under furniture, dirt and dust. Included accessories include: One removable lithium-ion battery, a Charging Dock, Duster Crevice Tool, Pet Multi Tool, Anti-Allergen Dust Brush. Cordless Vacuum Weight: 7.2 lbs. Smart-Review Commentary: The Shark ION Rocket combines a powerful ultra lightweight (7.2 lbs.) upright vacuum with a detachable handheld vacuum. Swivel steering makes it easier to maneuver than traditional fixed wheel vacuums. The brushroll is motorized, so is suitable for both carpet and hard floors. A handheld vacuum detaches and will get dirt, pet hair, and dust off your upholstery, stairs, and car interiors. This unit comes with 1 battery. You can purchase extra batteries for this model. Unlike many cordless vacuums, this one has LED headlights to see under furniture or dark places. Shark also includes other tools to help in cleaning. You can upgrade to the IONFlex DuoClean (see below) and get Triple particle cleaning and a more flexible vacuum. This model has received excellent reviews by consumers. This model is a Smart-Review top pick for cordless vacuums. DuoFlex Is this the best price?